The Cincinnati Reds (70-51) completed a three-game series sweep against the Arizona Diamondbacks on Thursday. After losing three straight to the St. Louis Cardinals (65-53) last week, the Reds have won six straight games as they outscored the Marlins and Snakes 40-20. After Thursday's 9-5 victory, the Reds moved 3.5 games ahead of the Cardinals in the NL Central standings. Friday, the Reds will begin a three game series against the fourth-place Dodgers. The Reds are 0-12 at Chavez Ravine since they defeated the Dodgers there on July 28, 2005. The Cardinals will begin a three game series against the San Francisco Giants (68-54) at Busch Stadium on Friday. The Giants are currently six games behind the San Diego Padres in the NL West. The Reds will face the Giants to complete their West Coast road trip, in San Francisco, starting Monday. Go Giants........at least for now. Homer Bailey will be making his second start since coming of the disabled list on Friday. During his last start, against the Marlins, Bailey hurled six scoreless innings allowing only three hits in a 2-0 Cincinnati victory. Bailey has faced the Dodgers three times in his career and is 1-1 with a 6.19 ERA. 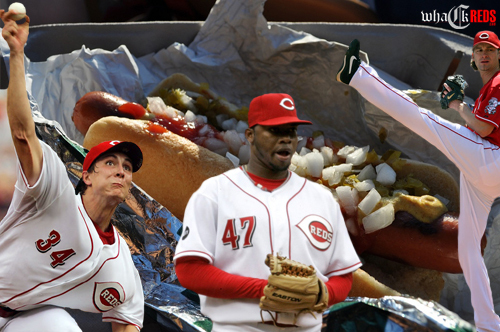 On April 20 of this year, Bailey helped the Reds defeat the Dodgers 11-9 at GABP. Vicente Padilla has appeared in 15 games against the Reds during his career, but has started against them only seven times. Padilla is 4-2 with a 4.11 ERA in those starts. Padilla lasted just 4.1 innings (8H, 8ER) against Atlanta during his last start. Johnny Cueto has never beaten the Dodgers and will face them for the first time this season on Saturday after serving a 12-game suspension. In just two career starts against the Dodgers, Cueto is 0-2 with a 3.00 ERA. During Chad Billingsley's last start against the Reds on April 20, he lasted only three innings as he allowed seven runs (4 earned) on seven hits. In five major league seasons Billingsley has started against Cincinnati six times and owns a 3-2 record with a 3.21 ERA. The Dodgers have lost their last four games that Billingsley has started. Bronson Arroyo will be making his eleventh career start against the Dodgers on Sunday. In ten starts against the Dodgers, Arroyo is 2-4 with a 4.21 ERA. Clayton Kershaw will be making his third career start against Cincinnati. He is 1-0 with a 1.88 ERA during their first two meetings.